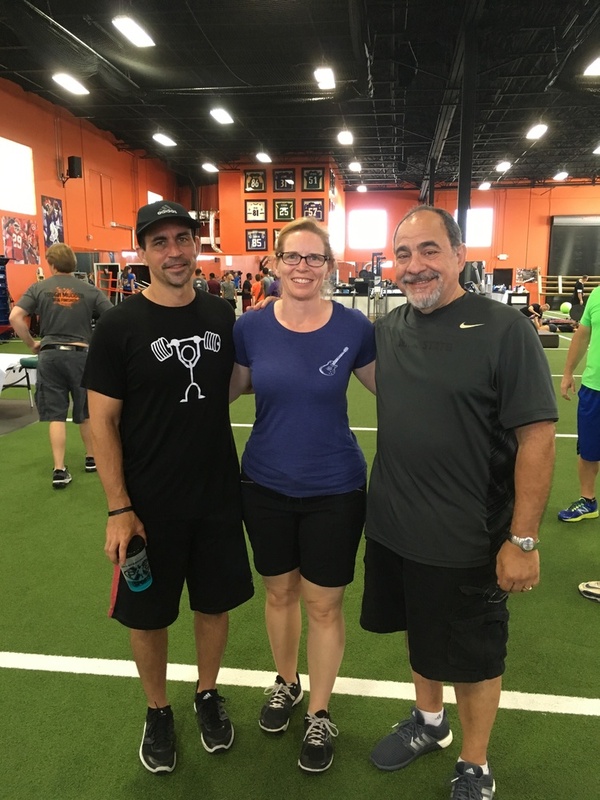 In January I went back to Florida to take part 2 of the XPECORE class with George Kousaleos. We spent the mornings in class and we spent the afternoons at XPESPORTS working with college students training for the NFL Combine. It was such a great feeling to be a part of the team. Watching several of the athletes I worked with get drafted was a great feeling as well! I have worked with athletes in my office from NFL players to high school athletes, but when I got back from Florida I wanted to be a part of another team, so I reached out to East West Kung Fu and I was soon working with the Lei Tai team. 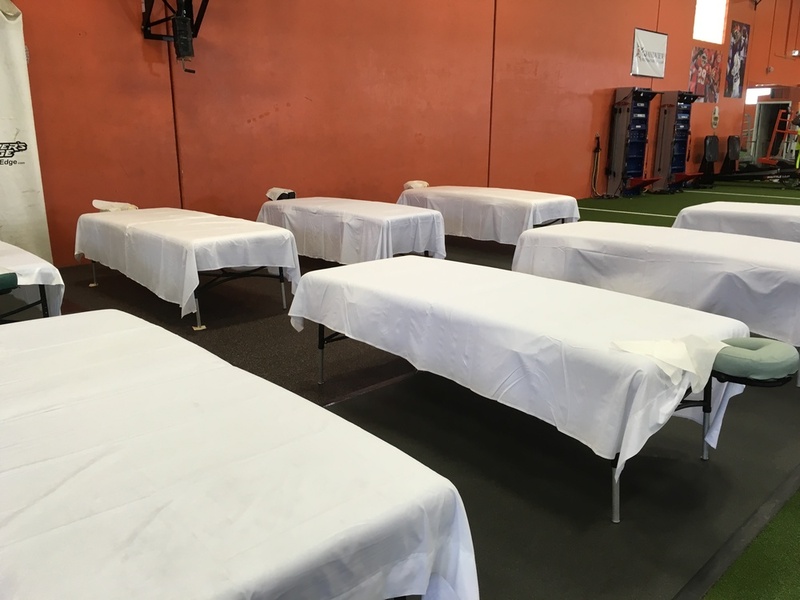 I brought my shiatsu mat to the school and worked with a few athletes per session. They were so appreciative of my time and they were always so happy to see me. It was a great feeling to be on the team. My job was to keep them going and help with their recovery so they could go on to perform their best! I am heading back to FLORIDA!!! January 7th through January 13th. I am heading to Florida for the XPECORE Advanced Core Myofascial Therapy class. The class is daily learning with real world application. 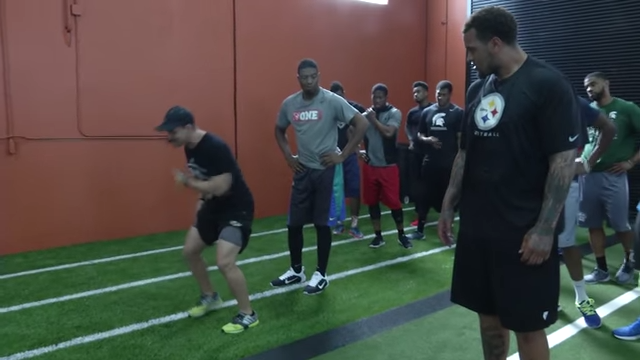 Last year I worked with NFL athletes as well as MMA, NHL, and retired professional athletes. During this class, we will be working with athletes who are working to hone their skills for the NFL combine. I had lots of fun last year and learned so much. Can't wait for the adventure and to bring back new skills to my work. Don't miss me too much!! Work space at the training center. Relaxation and recovery make the best gift! Now through December 18th, all gift cards will be 20%. You can choose from 30, 60 and 90 minute massages as holiday gifts for your friends and family . . . or you can buy one for yourself! Gift cards can be purchased online or in person and I am happy to deliver them by mail. If you have any questions, please don't hesitate to call or e-mail. Anja has been a client for a couple years now, and I love that I am a part of her self care. She does so much for so many people. From teaching, to volunteering, to caring for and having adventures with her family. I always look forward to working with her! Q: How often do you come in for massage sessions? A: I try to come in every other week. My neck will tell me if I waited too long. Q: How do you feel massage helps you? A: I can feel the effects of your massage right away: after half an hour of muscle kneading, I don’t feel my head anymore - that might sound dramatic, but it’s the best way to describe how your hands bring away the heaviness in my neck with which I usually arrive at the session. During massage I can feel the lymph fluid being drained from my head, and I have the impression that there is a better flow throughout my upper body. The massage itself is very relaxing. Since I get a massage regularly, I very rarely complain about tension headaches anymore. Q: What would you tell someone about massage that has never received one before? A: I would tell the person that if s/he loves her/his body, s/he should definitely indulge into a massage from time to time. We abuse our bodies by sitting long hours at the computer and should give back some tender care once in a while. LONDON......OOOOPS!!! New York here we come!!! My family and I will soon be off to London! At least that was the plan. Come to find out, our kids' passports had expired and we did not notice until the day of our flight to London. So we canceled what we could and booked a week in NY. We will do our best to get to London next year, with up to date passports! I will be out of the office from June 1st though June 12th. I will open up the calendar so that appointments can be scheduled online through the end of June before I hit the road. I will be able to confirm appointments, but it may take me longer than usual due to the time difference.